Parents of students at Westside and Orangeville District Secondary Schools have received letters warning them of the pending strike, which could affect the beginning of the school year. 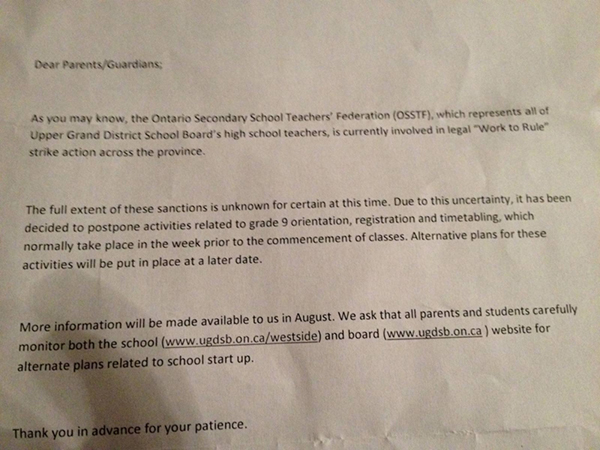 The letters, which were received by many on Thursday, explained that the Ontario Secondary School Teachers’ Federation (OSSTF), which represents all high school teachers within the Upper Grand District School Board, is currently involved in a legal “Work to Rule” action province-wide. Because of the uncertainty surrounding the situation, the high schools have decided to postpone activities in relation to grade 9 orientation, registration and timetabling. These activities would normally take place the week prior to the first day of school, but will be put in place at a later date when more is known. Currently, the Upper Grand District School Board is asking that parents carefully monitor both their local high school as well as the board websites for further information and alternate plans related to the school start up. The school board website is www.ugdsb.on.ca.